LNG applications make especially good economic sense in poorly developed areas that are not connected to a gas supply system. These areas often lack the capacity for high-throughput electrical connections. Producing low temperatures with conventional compressor technology thus becomes a problem. Since regasification cold works almost without electricity, only low-power connections are required. Regasification cold by Eco ice is also suitable for applications in commercial refrigeration. It can also be used for a system size of less than 100 kW cooling capacity. This area is still largely overlooked in the recovery of cold for the regasification of LNG. 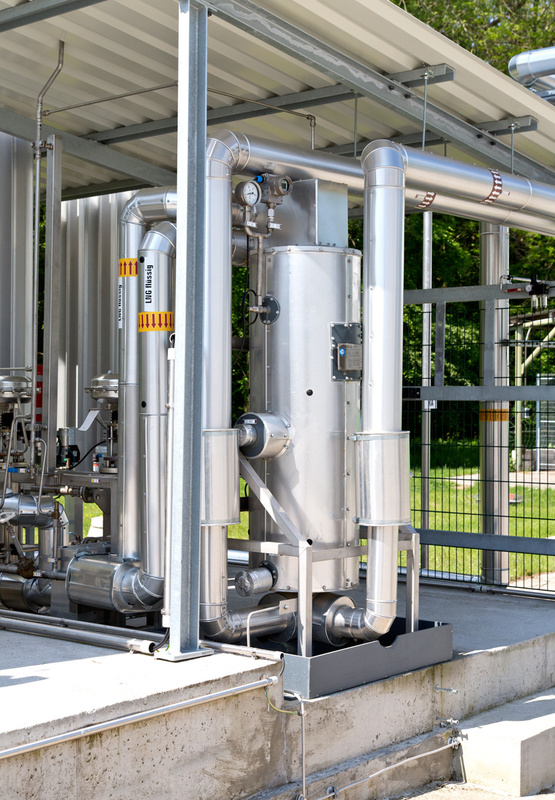 In contrast to other known cooling systems that can be operated without mechanical compressors, the regasification cold by Eco ice is suitable for effective temperatures up to -38°C. At the same time, applications to the freezing point and air-conditioning applications can also be achieved. Regasification cold by Eco ice does not need mechanical compressors. There is only one pump for circulating the brine, which operates very quietly. The vibration of mechanical compressors, often a nuisance for users, is not a concern with our system design. Due to the use of stainless steel in the essential components, high operational reliability and system availability is ensured. Regasification cold by Eco ice has very few moving parts and is therefore virtually maintenance-free and very long-lasting. Expensive maintenance requirements resulting from the F-Gas Regulation (Regulation (EU) no. 517/2014 on fluorinated gases) are not a problem because only “waste cold” is used here, which would otherwise have been released into the environment, and no refrigerant with ozone depletion and global warming potential is used.